With tears streaming down my face, but a huge smile…because I adore the light from such a beautiful friend. Be Still has been a part of my life as long as I can remember, so much so, it is tattooed on my side. It’s my constant reminder to slow down and trust. I’m not sure I could ever be so strong, but I do know I’m blessed to know you and your faith keeps me focused. Much love and momma hugs. No words, just tears of grief mixed with joy. Glory to God. My deepest condolences for your loss! Nora has been an inspiration to me and a lot of people. May God receives her into his Kingdom and may God bless you for being wonderful parents and give you more strength to deal with this tremendous loss! Beautifully said, Sarah! Thank you for sharing so much with us, Aleisa. I’ve followed your story from pregnancy on and have always read every blog post but never offered any words. I am blessed to have been able to know Nora’s story through you. I mourn the loss of her on this earth with you and your family. What an amazing journey her two years were! Love and prayers to you all. Yusko family, what a precious gift Nora is, and how blessed you are to be chosen by God as her family! I’ve been a silent follower (from Ukraine) since a few days after Nora was born, and have been so blessed and encouraged by Nora and your family. I’m not one to comment much on things online, and have simply followed your blog from a distance for 2 years. A few moments ago, I was reading an online discussion on abortion and came across a person challenging people to consider the babies that will never live a normal life. In their words, “Would you selfishly force the child to live a long life of pain and suffering to some birth defects or would you mercifully allow the child to suffer a short (still painful) death and mercifully allow the parents to try again for a normal, healthy baby?” The fiery emotions that welled up inside me caused me to do something I rarely do – write a reply. My emotions centered on one thing – “What about Nora?” It is simply unfathomable for me to consider a world that would have never had the joy of having Nora’s presence here. It is even more unfathomable for me to consider that anyone could dare say it would have been merciful to deny her the joy she had living in this world. My response was to challenge this person to look at this blog and then try to proclaim that Nora should not have lived. To read and understand the “suffering” she had in this life, and see her smiles and hear her squeals, and try to claim that she did not thrive on life and love! When Nora caused such an immediate, fiery rise of emotions in me, I knew it was time to make a comment here on your blog. Nora and your family have had a lasting impact on me, and I doubt this will be the only time Nora jumps to mind as an example of joy, love, and life personified. Thank you for choosing to allow God to accomplish His will in Nora’s life, thank you for so generously sharing her life on earth with the world, and thank you in advance for any continuing sharing of your family’s journey that you choose to give. I cannot begin to imagine the pain your hearts are experiencing right now, and you all are in my prayers, that the God of all comfort would daily, moment-by-moment, tangibly and tenderly wrap you tightly in His loving arms. Beautiful words! Your family is so special!!! Thank you for sharing this! I wish I could have been there. I am sure I speak for so many in saying that. 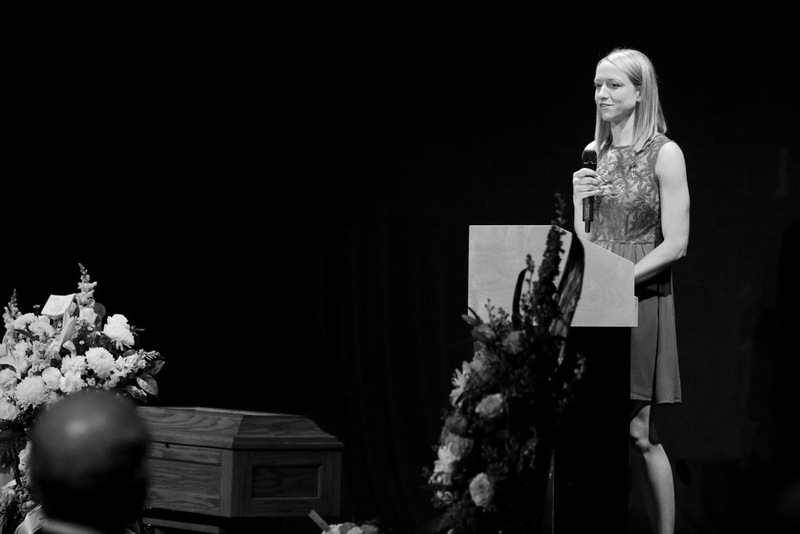 Nora has truly touched SO many lives through her precious life. And you all have as well. Much love today. Continued prayers!! So beautiful. My favorite…”How lucky are we to have had something that makes saying goodbye so hard”. How lucky are we because we know you can see Nora again. I may not attend the same church as you. But I believe in Jesus Christ, just as you. Thank you for sharing your faith and deepening my own. In my faith, I know that Families are Forever. Your family will be reunited. You will forever be Nora’s mommy. Someone lovingly made a comment on the Fb page that our children are not ours, but borrowed from God. I kindly disagree. But families are a part of God’s Plan. Our families here on Earth are a part of our heaven. I know I wouldn’t want it any other way. I love your family. You all are in my prayers as Nora will always be in my heart. What a honor it has been to join your family on this amazing journey, Your precious Nora Rose oh my word……..you will be so terribly missed. Beautiful words from a beautiful person! God is all knowing, and there is comfort in His plans and His ways. His perspective is a beautiful one, and I’m proud of all of you for accepting Gods ways in this situation. Nora was given such a sweet Honorable life. A witness that will last ages. Generations changed. What a wonderful tribute to you and Little Nora Rose. I have followed your story and laughed, cried,and held my breath until the next blog. Prayers were all that I could do for you and your family. I feel the pain and the strength that you have to keep going. Although, I’ve never met you I feel as part of the family (I know that we are family in God). I am the mother of three and grandmother of 11. I know how scary it is to find out that your child has a health defect. Our last little grandson was born with 3/4 of a heart and has gone thru 1 surgery and faces 2 more. We found out about it when his mother went in to learn the gender. It was all smiles and laughter (10 boys and 1 girl) until the dr. came back and told us the news of what he had and will go thru in life. He is our miracle child at 2 1/2 months old. Watching you and Nora love, laugh and strive has shown the world that there are no mistakes when it comes to giving birth and loving what God has placed in your care. I thank you for the beautiful writings and moments that you shared with us, just strangers. Nora gave us a heart that we sometimes forget we have for others. You gave us insight on God’s love for us…..once again thank you for sharing.